Lady's Fingers, gombo, gumbo, quingombo, okro, ochro, bamia, bamie, quiabo. In Spanish okra is quibombo; the French word is gombo, bamia or bamya, in India it is bhindi, and in the eastern Mediterranean and Arab countries bamies. The name okra' probably derives from one of the Niger-Congo group of languages (the name for okra in the Twi language is nkuruma). 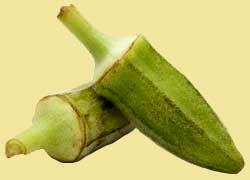 The term okra was in use in English by the late 18th century. Okra is a member of the Mallow family, related to cotton, hibiscus and hollyhock. It is a tall (6 ft) annual tropical herb cultivated for its edible green seed pod (there is also a red pod variety, which turns green when cooked). It has heart shaped leaves (one species is cultivated for its edible leaves), and large, yellow, hibiscus-like flowers. The seed pods are 3 to 10 inches long, tapering, usually with ribs down its length. These tender, unripe seed pods are used as a vegetable, and have a unique texture and sweet flavor. The pods, when cut, exude a mucilaginous juice that is used to thicken stews (gumbo), and have a flavor somewhat like a cross between asparagus and eggplant. Okra probably originated somewhere around Ethiopia, and was cultivated by the ancient Egyptians by the 12th century B.C. Its cultivation spread throughout North Africa and the Middle East. The seed pods were eaten cooked, and the seeds were toasted and ground, used as a coffee substitute (and still is). Okra came to the Caribbean and the US in the 1700s, probably brought by slaves from West Africa, and was introduced to Western Europe soon after. In Louisiana, the Créoles learned from slaves the use of okra (gumbo) to thicken soups and it is now an essential in Créole Gumbo. Today okra is popular in Africa, the Middle East, Greece, Turkey, India, the Caribbean, South America and the Southern US It is not a very common vegetable in most European countries, except for Greece and parts of Turkey. Due to increased interest in American regional foods, these bright green, tender pods have gained more respect as a vegetable in the US, aside from its use as a thickener. Okra is a tropical plant which grows best in warm climates. It is available year-round, with a peak season during the summer months. The pods grow rapidly, being ready for harvest in about 60 days of summer weather, when grown from seed. They must be picked about 4 to 5 days after flowering, when 4 inches or so in length, before they mature and toughen. Okra comes in varying shades of green (there is also a new red variety), and can be smooth or have a ribbed surface. Purchase young, tender but firm pods. They should snap easily in half. The best varieties are a rich green color. Avoid pods that are dull and dry looking, blemished or limp. Store in a paper bag in the warmest part of refrigerator, as temperatures below 45º can damage okra. It does not store well, so use within 2 or 3 days at most. Do not wash until ready to use, or it will become slimy. When preparing, remember that the more it is cut, the slimier it will become. Aluminum pots will discolor it. Mature okra is used to make rope and paper! (Avoid those old woody pods!). Okra is excellent sautéed or fried. Very young, tender pods can be sliced, dipped in egg, breaded with corn meal and fried (a favorite here in the Southern US). Sauté with corn kernels, onion and sweet peppers. Okra can also be steamed, baked, pickled, boiled or stewed. Because of its similar flavor, it can be used in place of eggplant in many recipes. Use it raw in salads. Avoid long cooking times unless you are making soups, stews or gumbo. When the pods are cut, they exude a mucilaginous (thick and sticky) juice that is an excellent thickener for stews and soups, especially Créole Gumbo. The flavor blends well with acid foods such as tomatoes. Remember, okra is slimy and sticky - it is supposed to be that way. If you object to this quality, don't eat okra. You can't get rid of this quality by soaking or overcooking. Accept it and like it. Or not. Okra is a good source of vitamin C and A, also B complex vitamins, iron and calcium. It is low in calories, a good source of dietary fiber, and is fat-free.